Posted: October 15, 2016 Category: Vet Blog Post! 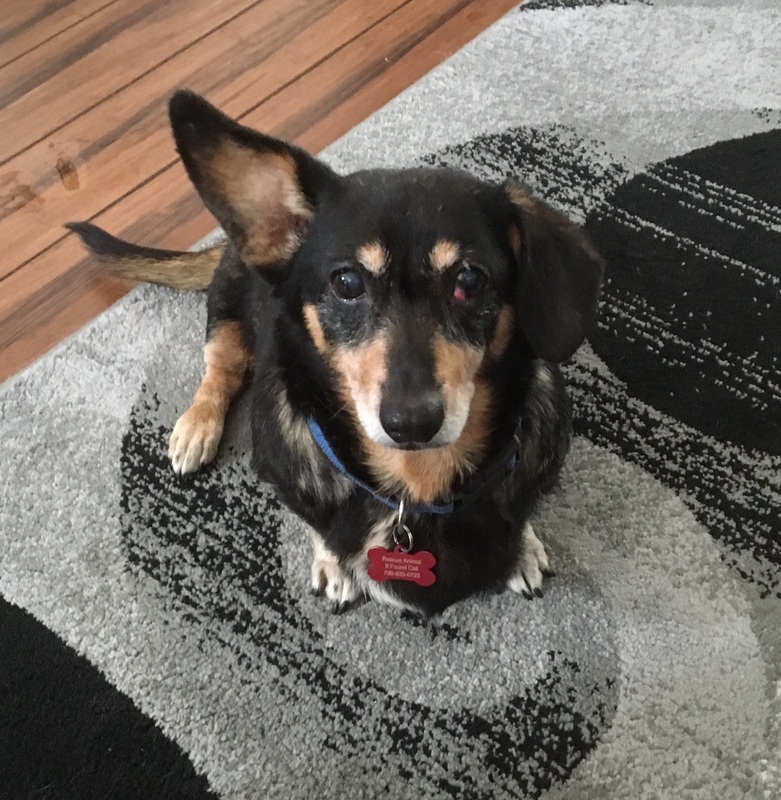 When we met Nikki, the adorable rescue dachshund, she had dental disease, a cherry eye and bladder stones! Meet Nikki! She is a gorgeous 8 year old dachshund who arrived at the Denver Dachshund Rescue and Transport (DDRT) which adopts out dog across Aurora and the metro area. Nikki came in with a number of medical concerns, including bladder stones, a cherry eye and a broken tooth. She was a rock star patient, and we wanted to have her help us teach you about some of these conditions. In the first installment, we will discuss bladder stones – you won’t believe the x-rays and rocks that came out of this poor girl! We want you to understand how bladder stones develop, how they are treated, and ways we try to prevent them. In the second installment we will talk about cherry eyes – what the heck are these, and how do we fix them? In the final installment, we will talk about a fractured tooth. Most dachshunds don’t have the best dental health due to their genetics and shape of their muzzle, but Nikki’s teeth were pretty good, except for this bad one – we want you to learn about what to look for! Nikki had x-rays taken after some blood was seen in her urine, and look what we found! The first x-ray is a normal dog, and the arrow points to a normal bladder. It is filled with urine, and the actual wall of the bladder is very thin, only a few millimeters, much like a water balloon. 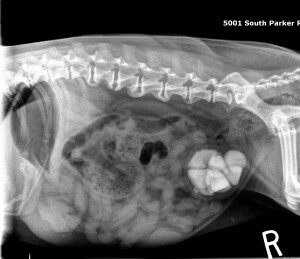 The second x-ray is Nikki’s abdomen, showing her bladder chock full of rocks! Her bladder wall has thickened so much from the chronic irritation of the stones that we can actually see it clearly around the bladder stones. 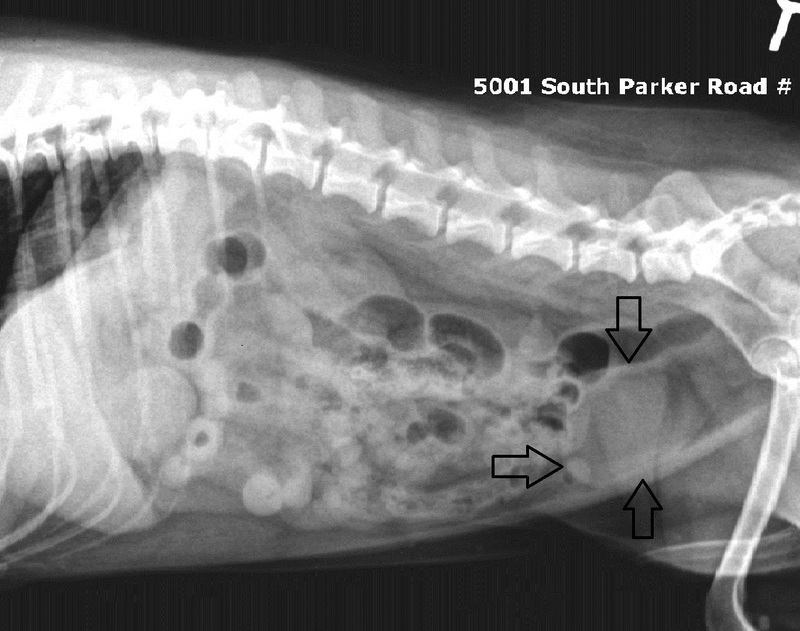 Minerals (such as those that make up bladder stones and bones) show up whiter on x-ray than the rest of the tissue, while gas and liquids (like her intestinal contents) show up darker. Where do bladder stones come from? Believe it or not, Nikki made them! Think of urine like orange juice. When the urine gets too acidic (pH too low) or too basic (pH too high), crystals of different minerals can form in the urine, kind of like orange juice pulp. If the urine is really dilute, like watered down juice, the crystals don’t have a chance to bump into each other very often. However, if the urine is very concentrated, like juice concentrate, the crystals come into contact frequently and begin to form ever-growing rocks. 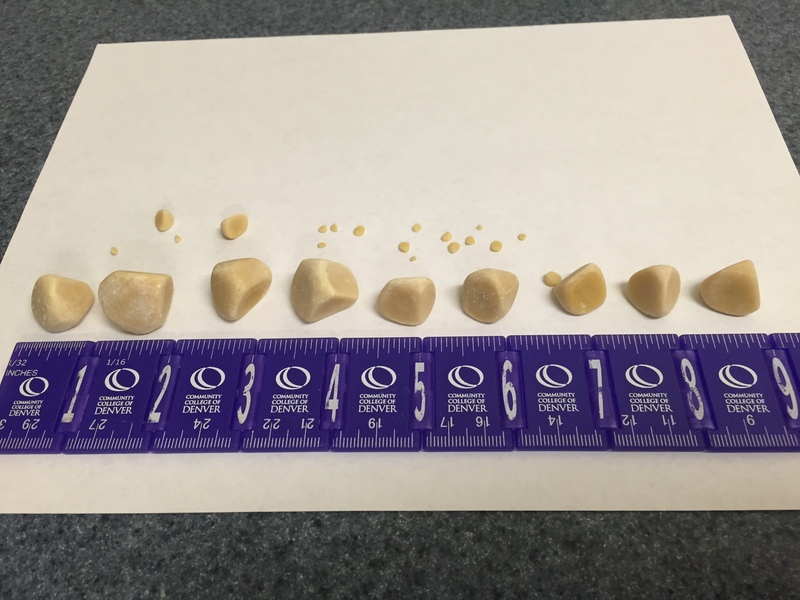 How do we treat bladder stones? Bladder stones typically have to be removed surgically, although in some cases they can be dissolved with a prescription diet. Surgery to remove these stones involves opening the abdomen, accessing the bladder, and cutting a hole into the bladder through which the stones are retrieved. In females, this is relatively straightforward, but in male dogs and cats (with longer and more narrow plumbing) this can be much more complicated, as stones can lodge into the narrow urethra and be difficult to remove. Think of the bladder like a giant water balloon – we find it incredible that you can cut a hole in the bladder, and then sew it up and get it to hold water again! The body is truly amazing! Normally the bladder is a very thin walled balloon. However, Nikki’s stones had been present so long that not only did they grow to nearly an inch in diameter, but also they irritated the bladder wall so much it thickened with inflammation to nearly 1/2” thick! We believe, in Nikki’s case, that this was due to a chronic infection with the bacteria E. coli, which causes the urine pH to go high, causing a type of stone called a struvite (also known as ammonium phosphate) stone. However, we are still waiting for the final results from the lab analysis of this stone. How do we prevent bladder stones? In some cases, if we can catch a urinary tract infection early and treat completely, we can avoid recurrence of bladder stones. However, most dogs and cats that have formed stones in the past will form stones in the future, just like with humans who suffer from kidney stones. We have two main goals to try to prevent stone formation – we want to keep the urine as dilute as possible and we want to keep the urine pH as neutral as possible. We can achieve this through several methods, including canned prescription diets, careful choosing of treats/table scraps outside of these diets, and encouraging water consumption through fountains and other tricks that make drinking water more appealing to a pet. Most of the time, regular monitoring of the urine and bladder x-rays is needed to identify early causes for concern, in an attempt to avoid repeated surgery. Diets commonly prescribed for this condition include Royal Canin SO, Purina Veterinary Diets UR (St/Ox), and Science Diet C/D Multicare. Could my dog or cat have bladder stones? How would I know? Any pain in the bladder or associated with urination typically causes the pet to have small, frequent urinations (since urinations typically burn), and also to lick excessively at the genitalia. Sometimes pink, red or brown urine is also present, and much more visible on carpeting, sidewalks and snow than on grass or soil. 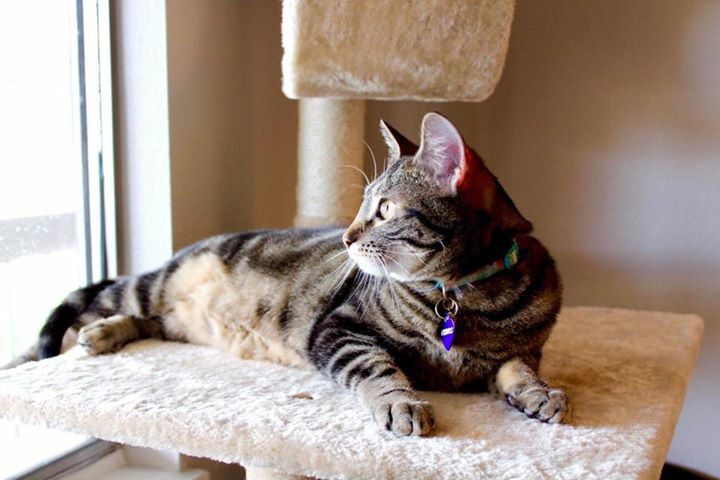 Frequently, pets also begin to urinate in abnormal places when they have urinary tract pain – cats often urinate outside of their litter boxes and dogs often have accidents in the house. This is because infection and inflammation not only create a feeling of urgency, but also the animal often is unable to recognize that it is the URINE causing pain and not WHERE it is urinating, so continues to find new places and surfaces on which to void. If you are worried you are seeing any of these symptoms, it is smart to call your veterinarian for an exam, evaluation of their urine, and an x-ray if there is reason to believe stones may be present. Truly the best vet I have ever gone to! The facility is clean and well maintained, which is sadly hard to come by these day. Upon arriving I was greeted by a friendly Vet Tech who was very excited to see my pup. She took me into a very spacious room and before beginning paperwork, she sat down and played with my pup for a few minutes. The doctor promptly came into my room and again sat down on the floor with my pup and got to know her first, before examining her. She was taken back for some tests and we received the results quickly, and the doctor had a very fair and honest recommendation for my pup. Absolutely great experience and a very fair price. If you are looking for a new pet, this is the way to go! I had to find a vet to see my hedghog which wasn't easy to find. I was so thrilled with Parkside Animal Health Center. They took such good care of her and even followed up with a call the next day to see how she is doing. They (the staff not just the vet who saw her) gave me a lot of options and the vet that saw her took the time to talk to me to figure out what was going on with her. Even though my hedghog is a senior and not going to live much longer I am so confident in the care and time she was given at this facility. I now have a vet I can rely and trust with my 2 dogs whom I now am so grateful for. It has been so nice to have a vet that we trust! We have always been so happy with Dr. Winton and the supportive staff of this office! Our husky is on the shy side and they always treat him so well. I love that even when we go for routine visits, I always get a follow-up call to check and see how my pup is doing! Even though we have moved, this office is worth it for us to drive a bit longer to get to! The veterinarians and staff here are top notch!! Very clean and fair pricing too! I highly recommend them. I love this place!! They have always been SO good to our dogs and honest. The vet knows my dogs by name. We’ve been coming here since we got our dogs 7 years ago and we would never leave. The best animal center I went.Happy with the service plus the only vet I trust. The Vets and the staff are wonderful! They always get me in when I need to bring my dogs in. I have a 15 year old chow and a 2 yr old Shiba Inu - they both have had health problems and we were able to get an appointment. I love this vet! My geriatric cat has always been difficult to bring to see a vet since it causes him (and the vet staff!) so much stress. I'm so glad I was referred to this office! They helped keep him calm, were so efficient in his exam, and quoted an excellent price for the procedure he needed done. I would highly recommend this facility to all pet-lovers! They were able to watch my parents' dog after a family emergency, and when we needed more time, they were able to keep her overnight with very little notice. She's a large, high energy dog, but she always came home tired and happy. We stumbled upon Parkside after moving to Colorado and needing a vet last minute for my dog before going on vacation. They were able to get us in on short notice and happy they did because we love them! Dr. Winston now sees both our dogs, she's very knowledgeable and great at explaining the plans. Appointments are on time and have been easy to schedule! I would definitely recommend this vet clinic and Dr. Winston! These people are wonderful! The lady that scheduled us was super friendly, and professional, the tech and dr were just as friendly and professional. The price seemed reasonable and they were very gentle with our little kitten. The place was super clean and had a calming atmosphere. My kitten was chillin, and felt comfortable enough to purr. By far the best vet we have ever gone to. Not only are they good at what they do but they are very affordable. This is our new vet for sure! The staff is great! They are always friendly and they give my sweet little baby homemade peanut butter treats after he gets his shots. Friendly caring staff that does a wonderful job to make my dog as comfortable as possible during visits. Great partners in healthcare. I bring all 4 of my kitties here. They are super friendly and professional. Moved here from Pueblo, and had the same vet for 14 years, I've just found my new vet for the next 14!! This place was great, staff was outstanding and can not say enough great things about this place. Really glad we found you!!! We love our vet! They always are so welcoming and friendly and they take amazing care of our fur-babies! I switched vets a few years ago to parkside. I’m so happy I did. They have so much patience with my dog who has anxiety. The whole office staff is amazing at answering questions who may have. I wouldn’t take my animals any where else because I know they are in good hands. Great doctors and staff who are very caring and knowledgeable. No pressure medical care is also great and important to us. This clinic is clean, calm and friendly. I love the veterinarians and I appreciate their insight and advice. Both of my dogs have had wonderful experiences here.Also, calling in a prescription refill has never been easier. I've had negative experiences at other clinics with refills not being filled or prescriptions being misplaced. When I call Parkside, they typically have the medications ready within the day. I absolutely love this clinic. The vets and techs are so attentive and nice. They always call to check up on my babies after their appointments. You feel like you and your pets really matter to them here. I highly recommend Parkside Animal Health, they have been taking care of our pup for 2 years now and have always been great. All the staff is friendly, professional and caring. We have seen all of the vets in the practice and they have all been wonderful each time we’ve had to come in. I love Dr. Barrow, I've never felt so comfortable with a vet handling my babies. My dogs positively adore her and the rest of the staff. The rabbits are less than enthusiastic but I think that's because they're rabbits lol! Everyone here is so caring not only about the animals that come through their doors but about the people as well. I always recommend them! Parkside Animal Health is a wonderful veterinary clinic! Everyone there is so kind and courteous. You can tell that they love animals and are passionate about their jobs. To me, that matters a lot in addition to the care that your animal(s) get (which is also top notch!). When we took our cat in for her wellness exam appointment, they got us right in with no wait, which was good because our cat does NOT like trips to the vet haha. I highly recommend them to anyone looking for a Denver area vet! My baby Ragdoll, Leo, who is 12, had to be shaved and several teeth extracted in August 2018. After crying hysterically the vets were very sympathetic and caring to how I was feeling. Leo came out extremely healthy and as energetic as a kitten. I will be trusting Leo in their hands going forward. My experience here was great! My dog is very stressed at the vet but they made her more comfortable and got the exam and vaccinations done with as little stress for her as possible. They were great! Everyone was AWESOME!! Thank you for making Mary, as well as my husband and I, feel so comfortable in your care! We definitely found our new permanent vet as newly Denver residents! I originally took my female German Shepherd, Maya to another vet and was very disappointed. When I changed to Parkside Animal Health Center I was amazed at the difference. Maya usually sees Dr.Barrows, but when she is off, she has seen the other 2 doctors and received the same loving, caring, gently treatment as Dr. Barrows provided. I would recommend Parkside to everyone that loves their animals and want the very best care for them.